I felt really anxious about leaving Ziguinchor but I shouldn’t have been worried. 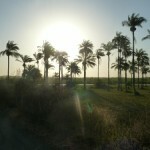 Cycling south from Ziguinchor through The Cassamance region of Senegal. was great. Lovely scenery, friendly people, and lots more bikes than I’d seen in a while. 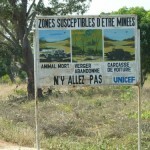 I saw signs warning me of landmines, a legacy of the seperatist movement in this part of Senegal, however I’m not too sure how current these warnings are, the signs looked very old. 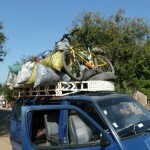 It was only about 25km to the border with Guinea Bissau. No problems at the crossing, no bag inspection and no bribes! Easy and quick. 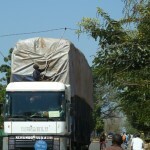 The lorries coming from Senegal were seriously overloaded. They were piled so high with goods that they had men sitting behind the cab with long rods to raise electricity cables as they went under. A few miles on in Sao Domingo I was approached by a German man who was on a round the world tour of sorts on a 125cc motorbike. Aisa to Germany, down West Africa to Cape Town and back up East Africa to Germany! We had lunch together (I understand that it was beever of some sort…) and it turned out he was staying with a German expat locally. I was invited to stay and stayed for a couple of days. 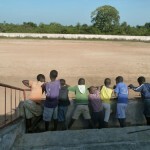 Neals (expat) is training a couple of youth football teams, he calls the team Africa United! They’d just received a delivery from the German football association of a full set of kit for the team. The local Guinea Bissauian team in Sao Domingo now have sparkling white German football kit! The kids really seem to love playing football and they’re very good at it. The public schools here have been closed for a few months because the teachers are on strike, because they haven’t been paid. The kids seem to be really bored, they were excited when we’d ask them to go to the shop for us, or get water from the well, just to give them something to do. I camped out in the yard, the first night I didn’t sleep very well. The combination of a Voodoo wedding ceremony with trance like druming and a family of snorting snuffling pigs outside the tent made sleeping a little difficult! I left Sao Domingo early in the morning, I had a long way to go to Bissau and had to get to the Guinean embasy before it closed for xmas (it was 23rd December). I cycled all morning for about 50km to a town called Ingore where I got a minibus taxi to Bissau. 80km very quickly and easily skipped, for only about £3 including putting the bike on the roof. I made it to Bissau at about 1430 and got the visa the same day. Easy! 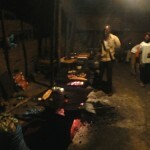 I liked Bissau, it had a nice relaxed feel to it. Only a little hassle from sellers, but a great place to spend a few days. Bissau has crumbling streets, no running water, no electricity, rampant poverty but it seemed very friendly. Guinea Bissau has no functioning electricity grid, everywhere either gets by on candles, torches and batteries, has their own generator, or buys a connection to a private generator. The same goes for water, people use wells, or pump water from a well into a home made water tower. I see evidence that it wasn’t always like this. There are electricity pilons, some intact with cables, but some without cables and broken in half. I see evidence of a water network via manholes and access points in the streets, but it doesnt seem to function anymore. I guess this is the legacy of colonial departure and civil war. I met an Italian/Danish couple at the hotel in Bissau and went to Christmas Eve mass with them at the local Catholic mission! We had a lovely dinner with two of the priests from Italy, followed by a packed church service. I imagine that this is what church was like when it was in Latin, completely incomprehensible, a mixture of Portugese and Creole! The music was amazing though, a really enthusiastic chior and lots of drumming, I really enjoyed it. A good way to end my stay in Bissau. This entry was posted in Uncategorized, West Africa on December 30, 2013 by Matt. Just found this new post. Love the picture of the man poking the electricity cables with a stick so the lorry can get under! One thing is missing from the pictures though – YOU! You need to use the self timer and get one with you in it! Not been eaten by lions yet then? Great to hear from you. Loving the stories.